class="post-template-default single single-post postid-355162 single-format-standard custom-background group-blog header-image full-width singular wpb-js-composer js-comp-ver-5.7 vc_responsive"
KEARNEY – A recent four-day work trip took Jason Hughes to nine different cities, with overnights in Oklahoma City, Boise, Idaho, and Boston. He made stops in Houston, Denver, Tucson, Arizona, Las Vegas, San Diego and St. Louis along the way. “Every day it’s something new,” said Hughes, who flies a Boeing 737 across the United States for Southwest Airlines. That’s what the Burwell native and 2002 graduate of the University of Nebraska at Kearney loves about his career as a commercial pilot. “It’s really cool to get out and see the country – and get paid to do it,” he said. 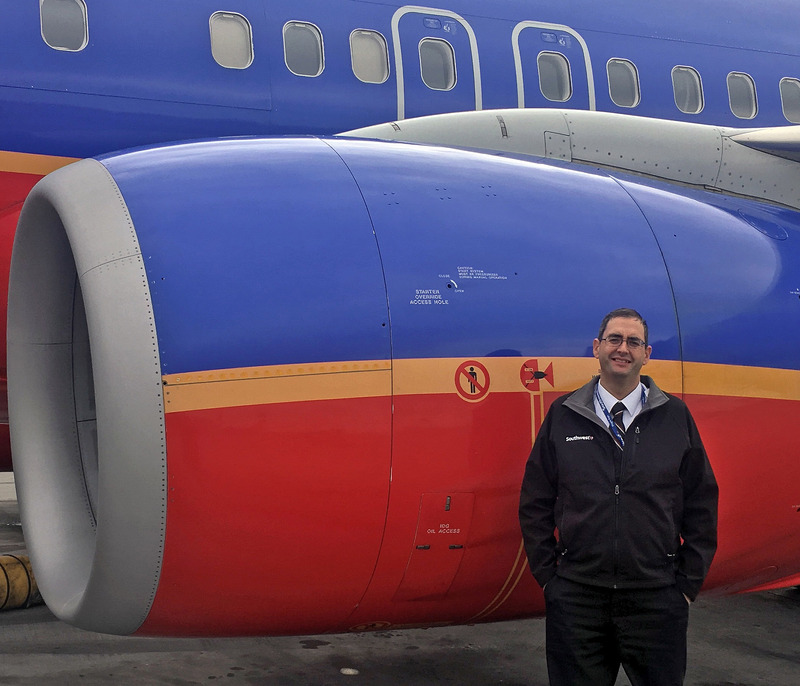 The 38-year-old Lincoln resident joined Southwest about three months ago after working as a corporate pilot and with Minneapolis-based Compass Airlines. He calls his current employer a “destination carrier” – the job you want to keep until retirement. UNK helped him get there. UNK is one of just two schools in the state with an aviation program, along with the University of Nebraska at Omaha. With around 60 students enrolled, UNK’s program is far from the largest in the country, but that’s also one of its strengths. Smaller class sizes mean students receive one-on-one attention from instructors who know them by name. This “personal feel” is what drew Jacob Barth to the program. The Stanton native was considering architectural design and aviation before an introductory flight influenced his decision. Barth, who graduated from UNK in 2007, credits Gibbs and the other instructors for creating such a strong, engaging program. “It offered the whole package bigger schools can give you, but with a more personal touch,” he said. The 34-year-old worked as a flight instructor for UNK and charter pilot before launching his own business in 2009. Midwest Management Solutions, based at Kearney Regional Airport, provides aircraft management and charter services for individuals and corporations with their own airplanes. 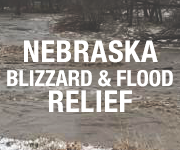 The business has five full-time and two part-time employees and serves clients such as Hornady Manufacturing in Grand Island, Adams Land and Cattle in Broken Bow and BD Construction and Cash-Wa Distributing in Kearney. Barth enjoys the corporate side of aviation because it allows him to travel the country while developing a close relationship with his clientele. UNK’s aviation program offers other advantages for students. The cost of flight training – about $55,000 – is traditionally in the bottom third for U.S. colleges and universities, according to Gibbs, who called Kearney “a very efficient place to train” because of its rural setting. “We have a great airport, but you only have to fly three miles and you’re into the practice area,” Gibbs said. UNK has one flight instructor on staff and utilizes other flight instructors through Big Air. Often, they’re current or former Lopers with flight instructor certifications. The university also contracts with Big Air, the fixed-based operator at Kearney Regional Airport, to provide planes for its flight training. Back on campus, UNK owns a Redbird flight simulator currently housed inside the Otto C. Olsen building. Using the simulator, students can practice flying in a multitude of environments – such as Colorado’s thin air, low-visibility weather or a busy international airport – and the unit can be adjusted to match the controls of several different aircraft. “With the push of a button, I can put us pretty much anywhere in the world,” Gibbs said. It’s also an important tool for students learning how to handle emergency situations, including engine failure. The state-of-the-art, motion-based simulator features a realistic view from the cockpit and dual controls that allow an instructor or co-pilot to perform maneuvers. It also records and replays flights for review. 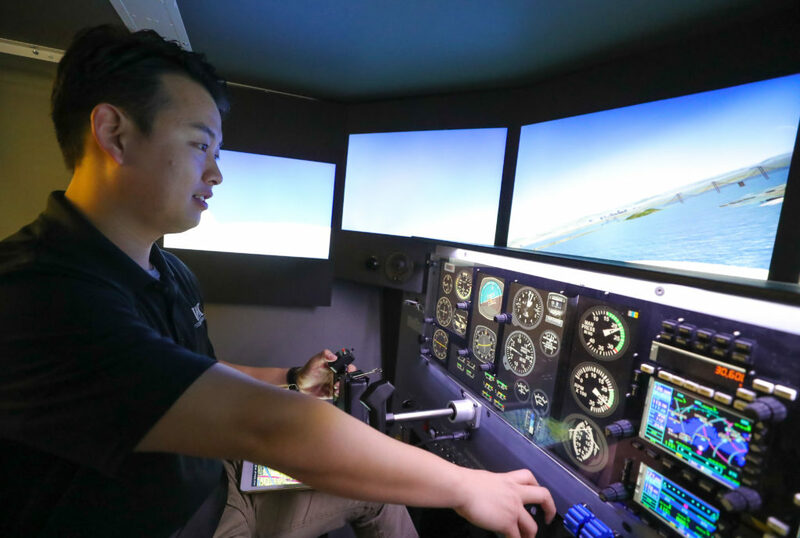 “It’s a really good experience for the students and it does save them a lot of money,” said Gibbs, noting that the simulator can be used for $60 per hour compared to $140 an hour for training in an airplane. Another selling point for the program is the current demand for flight instructors and commercial airline pilots. A nationwide pilot shortage prompted many airlines to increase wages and add incentives such as hiring bonuses and tuition reimbursement programs. The annual salary for an entry-level pilot at a regional airline has doubled over the past five years, according to Gibbs, and larger carriers pay experienced pilots well over $100,000 a year. Hughes, who knows fellow UNK graduates flying for Southwest, Spirit Airlines and United Airlines, said the aviation landscape has changed dramatically in recent years. UNK’s aviation program has a job placement rate above 90 percent for pilots, and it’s even higher for students with certain certifications. “I don’t know of anybody who has their flight instructor rating who hasn’t had a job within hours for the last five years, so we essentially have 100 percent placement in that area,” Gibbs said. UNK’s Bachelor of Science degree in aviation systems management includes a core grouping of aviation, technical and business courses, as well as a choice of two emphasis areas – flight operations (the professional pilot track) and aviation support services, which prepares students for careers such as air traffic controller, airport manager, aviation insurance representative and Federal Aviation Administration inspector. 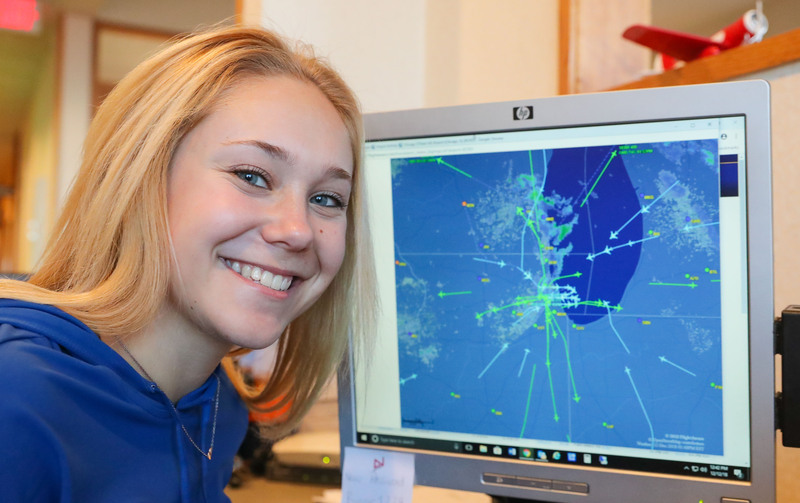 Erin Hallman, a junior from Lakewood, Colorado, and member of the Loper softball team, had an affinity for travel and aviation at a young age, so the major seemed like a natural fit. “It really piqued my interest that something I felt so passionate about early in my life is something I could continue to do and be more involved with,” she said. Hallman, who transferred to UNK after a year at the University of Maryland Eastern Shore, chose the aviation support services emphasis because she wants a career in the industry that doesn’t take her away from home for days at a time. She plans to leave UNK in May to enlist in the U.S. Marine Corps, where she’ll finish her degree online and receive training in air traffic control. Hallman knows her education up to this point has her in a good position. “I felt like I belonged here because I had so many people who were interested and involved and willing to help me be the best I could be,” she said. Colton Rolls also transferred to UNK from another school, but unlike Hallman, he didn’t come to Kearney specifically for the aviation program. 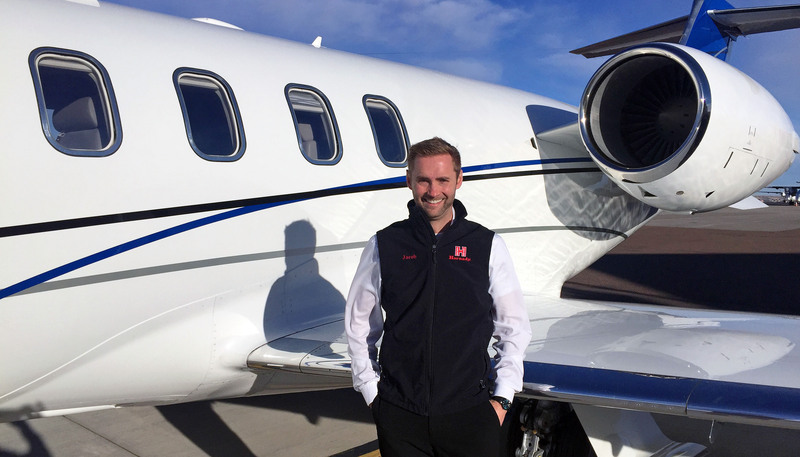 The Alliance native intended to study pre-physical therapy when he transferred from Western Nebraska Community College, then he discovered the aviation systems management major. “I’ve always been interested in flying, but I didn’t know I could actually do that as a career unless I joined the military and flew for them first,” he said. Rolls, who will graduate in July with the flight operations emphasis, said the strength of UNK’s program comes from Gibbs and the other instructors. “He does a great job of explaining everything we need to know both inside and outside the cockpit,” Rolls said. The UNK senior hopes to find a job as a corporate pilot that will take him to interesting destinations across the globe. That sense of adventure is what drives most UNK aviation students. KEARNEY – Maverick and Goose could double as guidance counselors. At least that’s how Jaehyun Kim sees it. “Top Gun” – the 1980s film starring Tom Cruise and Anthony Edwards as U.S. Navy pilots – inspired him to pursue a career in aviation. “It looked really cool,” said Kim, who graduated last week with a bachelor’s degree in aviation systems management with a flight operations emphasis from the University of Nebraska at Kearney. Kim, a native of South Korea, represents an important demographic for UNK’s aviation program, which is popular among international students. In fact, about 60 percent of the university’s aviation students come from outside the United States. Kim came to the U.S. as an exchange student and graduated from Nebraska Christian High School in Central City before enrolling at UNK. “I love to travel,” he said, which also contributed to his career choice. “Having him is the biggest strength because he teaches us how to become a safe pilot during class and outside of class in an airplane,” Kim said. Kim wants to be a commercial airline pilot and one day purchase his own airplane, which he’ll use to provide free transportation for missionaries serving in remote areas. In the near-term, he’ll remain in Kearney to work as a flight instructor for UNK’s aviation program. “I think it will be a really good opportunity,” Kim said.